In the post-digital world where the business world and the real world suddenly became very flat, your competition is everywhere. With so many choices, customers today are demanding more from their service providers than ever before. Meet their expectations and there is only a 50/50 chance you will see them again. EXCEED Their expectations, though, and there is a 96% chance they will return again and again. It all ends with your Customer. That’s right it all ends or culminates there. If you are to be an Experience Engineer, then you have to begin with the end in mind. What is the experience you want your Customer to have? What is the feeling, emotion or thought you want cursing through them after they leave your store or business or hang up the phone with you? What is the experience that will leave lasting impression and have them share about you on social media? Start there and engineer back. As important as the Customer experience is to your success, the Employee experience is equally important. In the new generations (Millennial and Gen Z) they demand more from their employer just the way the Customer demands more from their service providers. Your culture is the key to unlocking a remarkable experience for your employees. And we all know that the experience the employee receives determines the experience the Customer receives. Anyone who has a stake in your business performing well is a stakeholder. This group consists of investors, your bank, your vendors, your landlord and more. The experience they receive is a reflection of the experience your Customers will receive. Culturrific! outlines the exact process Matt takes with businesses to hope them install an experience culture. the principles are sound and work in any type of business or organization. Matt has worked with large corporations, small businesses, non-profits and even churches to change their current corporate culture into one customers and employees delight in. Matt’s insights and research serve as the foundation for his keynote speeches, workshops and training sessions. His style is practical and approachable. His sessions are engaging, entertaining, but most importantly impactful to your business. Corporate Culture can costs you thousands of dollars a year. People draw the majority of their self-esteem from their job. Millennials and Gen Z care more about corporate culture than the previous generations. The front line is the bottom line. If you want a remarkable Customer experience, then you better start with a remarkable employee experience. More employees know the mission statement of Star Trek than your own company mission. Culture is a living breathing part of your company. It’s the ‘unvisible’ parts of culture that trip you up. 12-part teaching series you can stream to any device at anytime! 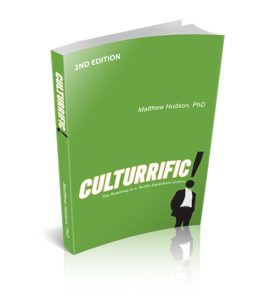 Can Corporate Culture Cost You Money?